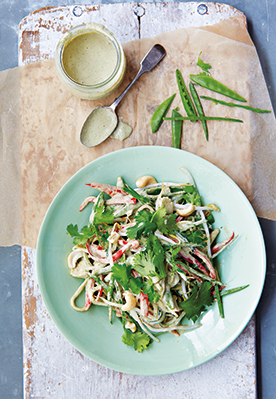 The spiralised noodles in this salad are great if you are trying to stay away from carbs. 1. Put all the sauce ingredients in a blender and whizz until smooth. Set aside. 3. Garnish with a sprinkle of cashews just before eating. Nutritional nugget: Beansprouts are a ‘living’ food – that ensures all the protein therein is at its highest available level. Adding these to any dish completes the protein requirement for a meal, as well as having the satisfying crunchiness of such fresh foods. Recipe take from Honestly Healthy For Life: Healthy Alternatives for Everyday Eating by Natasha Corrett and Vicki Edgson. Photography by Lisa Lindner. Published in hardback by Jacqui Small. Available now in full colour eBook format across the Kindle and Apple platforms.